One of the challenges that come with a successful garden is the issue of what to do with the excess produce you produce. Often you can give away what you don’t use, or sell it at a farmer’s market, but if you’d like to keep some of it for use later, when your garden is not offering up summer crops every week, you’ll need to preserve it. In past articles I have discussed canning, freezing and drying (dehydrating) various kinds of vegetables and herbs. Today I’d like to look at how we store these goods after they’ve been put up. Our house is quite small, and we do not have a basement, so storage of food is limited basically to things to be consumed in the very near future. 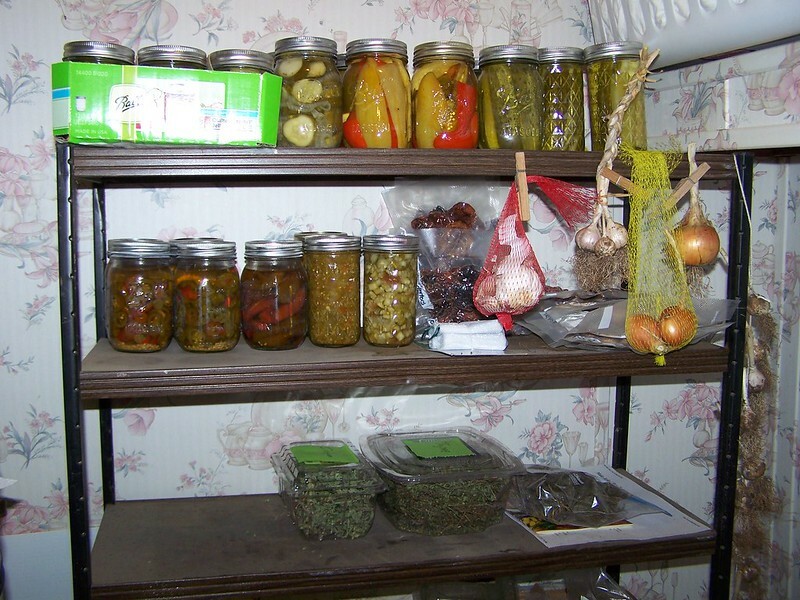 Most of the preserved food, and a little short-term storage, has been incorporated into my workshop: what Marie humorously refers to as our Grocery Store (as in store – or stash - of groceries). Occasionally she will call over on the intercom/phone saying, “Is this the Edwina Quick-Mart? I’d like to place an order for delivery please.” Other times she likes to browse to see what we have. We set up some shelving in my office to handle canned goods and dried produce. The office is the only area that is air conditioned, and subjecting canned goods to the 80, 90 even 100 degree heat of the workshop proper is not a good idea. I vacuum-sealed all of the dried goods (except dry beans) into serving-sized pouches so we need open up only as much as we would use. Dried goods include peppers (hot and sweet), tomato slices, apples, pears, and of course herbs. Onions and garlic can be hung in here after curing. They will keep well as long as they have been treated gently and have good air flow around them. Bruising them allows rot to set in. We were offered a second hand chest freezer at a good price. We make good use of that for long term storage of tomatoes, peppers, corn, green beans, okra and some herbs. This year I’ll be adding turnips, beets, squash and strawberries to the inventory. I prefer to vacuum pack as much as I can as this removes the air that allows freezer burn to set in and extends the safe storage time by at least double and up to 5 times, depending on how careful you are in packing the bags before evacuating the air. I often freeze the food on cookie sheets, quickly pack the frozen pieces into bags, vacuum seal them and return them to the freezer. This way, when the bags are opened up we won’t have one huge frozen mass to deal with, but individual pieces can be removed and thawed, returning the rest to the house freezer for use later. This is especially handy for tomato wedges, cherry tomatoes and peppers. Cooking for two seldom uses up large quantities of these. 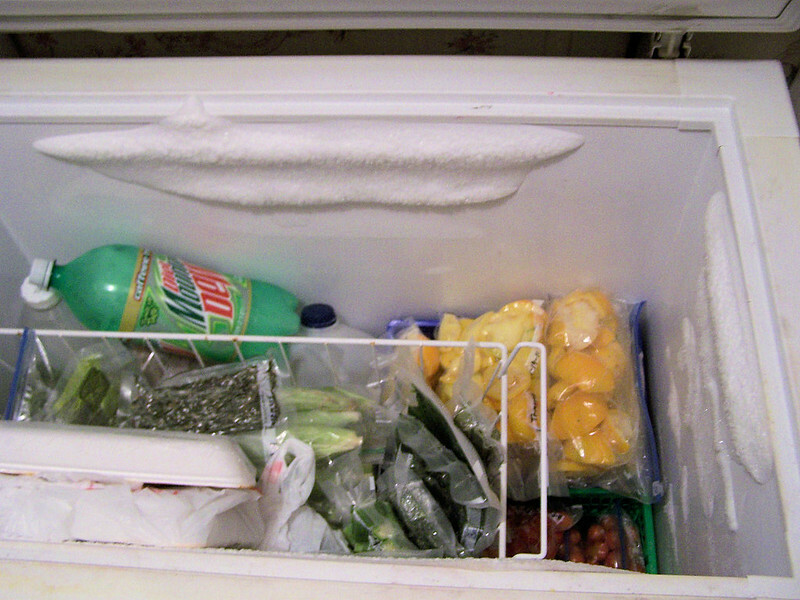 As we empty the freezer we add soda bottles and milk jugs of water to help provide thermal mass to get us through the occasional power outage without losing all our frozen food. In my office I have a mini-fridge that we bought at a friend’s garage sale for just a few dollars – a cheap luxury intended as a place to keep my lunch and to provide bottles of cold water (and an occasional “Dew“) while I’m working. 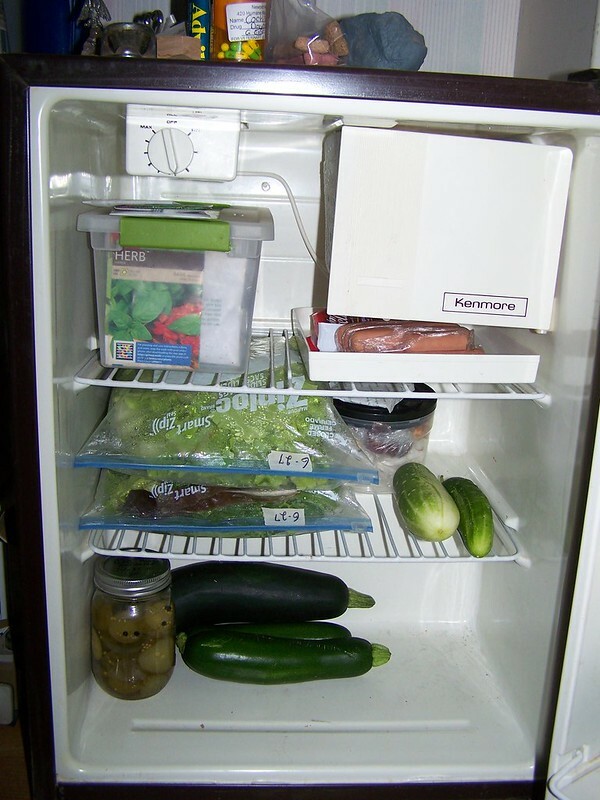 It has since been pressed into service as short term storage for cucumbers, zucchini and lettuce, three things the garden is producing faster than the fridge at home has space for. Some of this gets taken to work with Marie to share with her co-workers. Mom enjoys some of the lettuce but has her own squash and cucumber plants to contend with, and our new neighbors enjoy fresh veggies. But I need a “buffer” to handle them while we decide where they will all go. 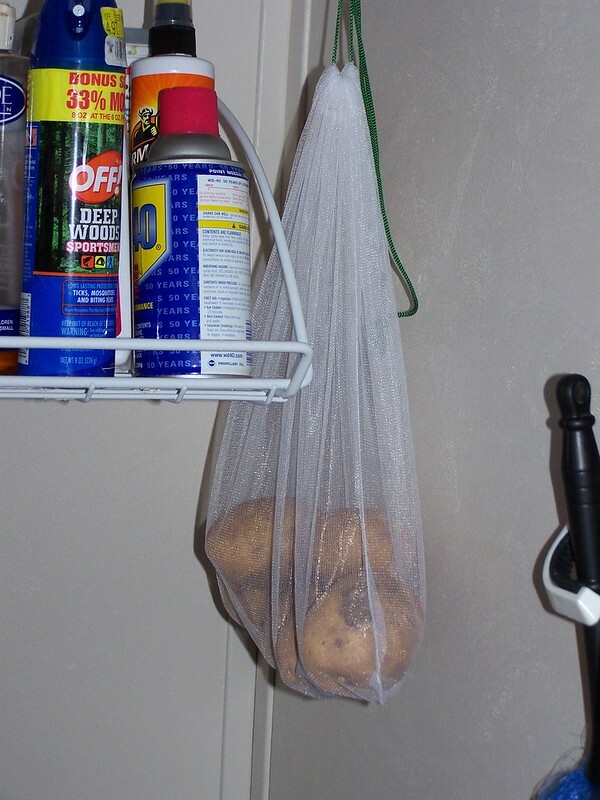 Potatoes could be stored in the office with the onions and garlic except that potatoes react badly to light until they’re cured out. Our early crop potatoes (Yukon Gold) don’t hang around long enough to fully cure because we like potatoes and they get eaten. I store them in a mesh bag hanging in a closet at home that is normally kept closed and dark – and somewhat cooler than my workshop. The main crop potatoes (Yellow Fin) won’t get harvested until late summer and they’ll go into a box of wood shavings that will keep them dry and dark for the few months that they will last. If we ever got so far ahead on potatoes that we were in danger of losing them I’d cut them into chunks, par-boil and freeze them for extended storage. Sweet potatoes don’t get harvested until late fall or early winter (typically the first light frost) and they’re tricky. They need to be cured for a couple of weeks at 85° then stored for the winter at around 60°. The 60° is no problem; at that time of year that’s the normal temperature of my shop and office. The 85° curing period may require setting up a space heater. If I’m very, very careful in digging up the sweet potatoes, curing them may not be as much of an issue as it could be because curing is normally done to “heal” wounds incurred while harvesting so they don’t rot. Using my raised garden bed method, we’ll produce somewhere around 75-80 sweet spuds at most and I will dig them out by hand. It’s the use of shovel, fork or especially a plow that will scrape and cut the tubers. Once properly stored these should keep all winter long. And that is our simple life strategy for food preservation. We do it on a small scale, but the same methods work just as well on a larger scale for those with big families and larger gardens (as well as bigger storage rooms – like a basement). What methods do you use to store food for later use? Great job with your shelves and canning. With some prodding from my wife, I put up some shelves in a basement room. 4x8 concrete blocks and 2x4 boards as shelves. It was easy, cheaper than buying shelving units and held the canning jars without much wasted space. This year we picked a lot of cucumbers (straight-8 and lemon) for pickles and dill relish. We also hit the farmers markets for two bushels of green beans, 2 bushels of corn, 60 lbs. of potatoes and 30 lbs. of tomatoes. After canning them, we put up some apple butter and strawberry jam. Also we have been drying our garden herbs (Basil, oregano, sage, rosemary, and thyme). Hi Dave! As I wrote this I was remembering reading your project on shelves and lighting. So much wonderful shelving- in a nice cool basement. What I wouldn't give for a little of that. I've actually thought about cutting through the foundation on the "high" side of the house and digging out an 8x8 root cellar where I could safely store some canned goods, taters, onions, carrots, and such. But... like you, other projects keep pushing that plan further down the priority list. This year was not a banner year in the garden for us either, so there really wasn't much urgency on that plan anyway. Thanks for dropping in, Dave! Allan, I'm kind of slow at projects. I've been working on a storage area for a couple years. It's supposed to be a winter project but since last year was the year without winter, I didn't get much accomplished. The shelves are in place but the wall to actually turn it into a cold room hasn't been built yet. Preservation of garden produce is rather scarce this year. Not because there wasn't any produce but because of other work projects. I just gave most of the produce away. Maybe next year will be the year of canning the harvest. Have a great garden harvest storage day.